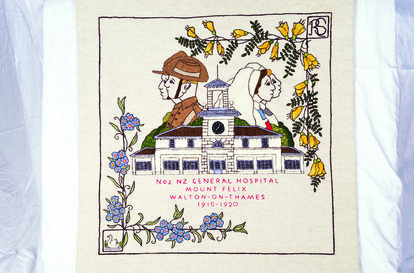 The Mount Felix Tapestry is a community stitch project created by more than 600 people in both England and New Zealand between 2015 and 2017. It commemorates and honours the 27,000 Kiwi soldiers who were treated at the Mt Felix ANZAC hospital at Walton on Thames from 1915 onwards, the dedicated doctors and nurses who cared for them and the local community who welcomed them into their hearts. This beautiful artwork ensures that the stories of courage, resilience, romance and friendship, set against a backdrop of the unimaginable horror of war, will never be forgotten. Designed by Andrew Crummy, this historical narrative has been transformed into a rich, lush story told in yarn, Created over thousands of hours by volunteers of all ages and experience levels, the tapestry celebrates the enduring spirit of community and connections across nations and over time. Be inspired by the Mt Felix Tapestry exhibition and make your own tapestry poppy in this children's workshop.